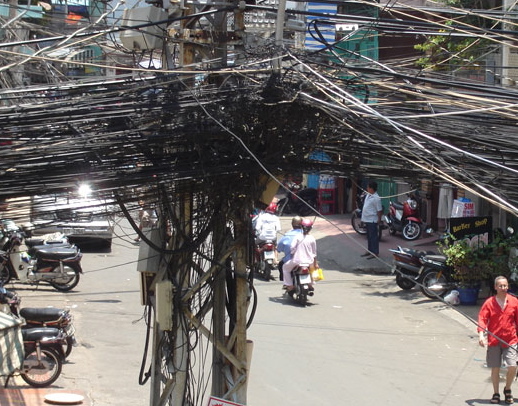 If your first thought on reading the headline was ‘dirty electricity – what’s that?’, you’re far from alone. So here’s a short explanation: Our reliance on technology has made life easier, but it has also led to an ever-growing amount of exposure to radiation. While there are various types of radiation, electro-magnetic frequencies (EMFs) are particularly worrisome, because they are so ubiquitous. EMFs are by-products of electronic usage, including devices like computers, kitchen appliances, cellular and cordless phones, handheld gadgets like Blackberries and gaming platforms, as well as wireless internet (WiFi). With millions of appliances, additional millions of cell phones and computers, and tens of thousands of cell towers operating in this country, we are being bombarded by electro-pollution, or “dirty electricity.” Yet, in spite of the prevalence of electronics in our lives, we have almost no data on how the radiation affects our bodies. What we do know about the health impact of electronics comes primarily from studies involving cell phone radiation. Those findings have prompted strong warnings and strict regulations in the European Union, measures that, for the most part, have not been implemented in this country. Here, only San Francisco is actually doing anything to inform the public that there may be a downside to our dependence on electronics, and so far, city officials are only highlighting cell phones. Far less research has been done on how human health is impacted by the dirty electricity emitted by ordinary electronic devices. For example, Magda Havas, PhD, a Canadian researcher at Trent University in Ontario, has determined that the dirty electricity produced by electrical wiring appears to elevate blood sugar levels in individuals diagnosed with either Type 2 diabetes or pre-diabetes. In one intriguing experiment, she found that after installing EMF filters to reduce the amount of dirty electricity in an environment, even Type 1 diabetics responded favorably, requiring less insulin than when exposed to radiation. Similarly, individuals with multiple sclerosis reported a decrease in tremors, better balance and less reliance on a cane for mobility in EMF filtered surroundings. So far, the results suggest that the smartest strategy is to minimize the use of electronic appliances whenever possible, while taking additional steps to avoid electro-pollution from the growing number of wireless networks surrounding us. Based on what we know today, here are some ways to reduce exposure and help our bodies counteract the effects of dirty electricity. 1. Use electronic devices sparingly, particularly those with variable speed options. Hair dryers, microwave ovens, fans, heaters, and similar appliances release large amounts of EMFs. Opt instead for manual methods of performing as many tasks as possible. Hand-wash dishes, for example, or alternate using a broom with vacuuming. 2. Eat as much fresh, organic produce as possible, to provide the body’s cells with nutrients that can repair damage caused by dirty electricity. 3. Drink plenty of clean, fresh water to flush toxins from the body. 4. Engage in regular, moderate exercise to encourage sweating and further eliminate toxins. 5. Ask your physician for recommendations on detoxification and immune-boosting products. There are many to choose from, and your doctor can help you select the ones that are right for you. 6. Unplug as many electrical devices in your home as possible when they are not in use, particularly those in the bedroom that could be emitting dirty electricity while you sleep. If you have an electric alarm clock, replace it with a battery-powered version. 7. Choose as many non-toxic cleaning products as possible, to reduce chemical contamination in your home as well as your body. 8. Look into EMF filters and “earthing” products, like those from Barefoot Connections that help ground the body and reduce electrical stress. 9. Invest in a pair of shoes with soles made from a natural product, like hemp or undyed leather or spend some time walking barefoot outside. Hugging a tree (seriously!) for a few minutes is another way to rid your body of stored dirty electricity. 10. Minimize the amount of time you spend in areas where wifi is available, like internet cafes. 11. Use cell phones as little as possible, and do not keep your cell phone on your body. Unplug your cell phone charger when it’s not in use. 12. Invest in an LCD computer screen and television set, which emit less radiation than plasma screens. Expect to see more information on reducing radiation and exposure to dirty electricity in the near future. This is a field that is just beginning to be studied. But in the meantime, while science is sorting out the details, the good news is that you can take steps to protect your health. Because I’m sharing this recipe for the Best Potato Salad in the World with you. Really … Best. 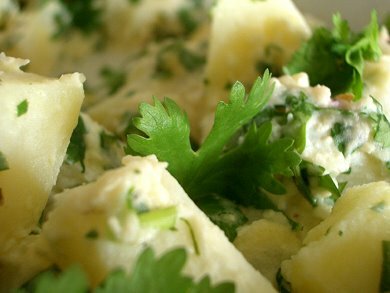 Potato Salad. Ever. It’s fast, easy and tastes amazing — WAY better than super-sized fries! No eggs to boil, either. (To reduce the fat content, use low-fat mayo and skim or 2% milk.) Seriously, this is like a meal in a bowl — a really good, tasty, healthy meal!